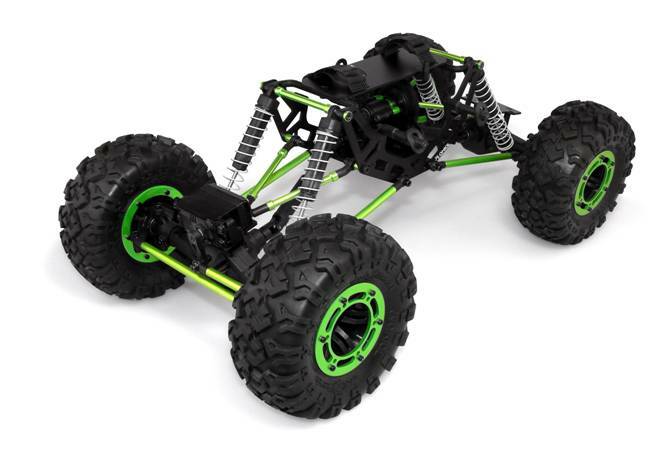 The Traxxas E-Maxx is possibly the most popular choice of models for off-road robots that are based on a commercial RC vehicle. The E-Maxx is a very popular vehicle in the RC world and so there are plenty of used vehicles available on eBay and also plenty of aftermarket parts. However, the E-Maxx may not be the best type of vehicle for off-road robotics. The niche hobby of RC Rock Crawling probably most-closely matches what an off-road robot is supposed to do: navigate unknown terrain and maintain traction. These crawler vehicles have articulation that allows the fixed axles to conform to the terrain they traverse. Unfortunately, there are not many commercial crawler models available. The Axial AX10 Scorpion (seen to the right) is one of the few. Ultimately my budget dictated my choice of vehicles. The Argonaut project is an attempt to do as much as possible using as little money as possible. 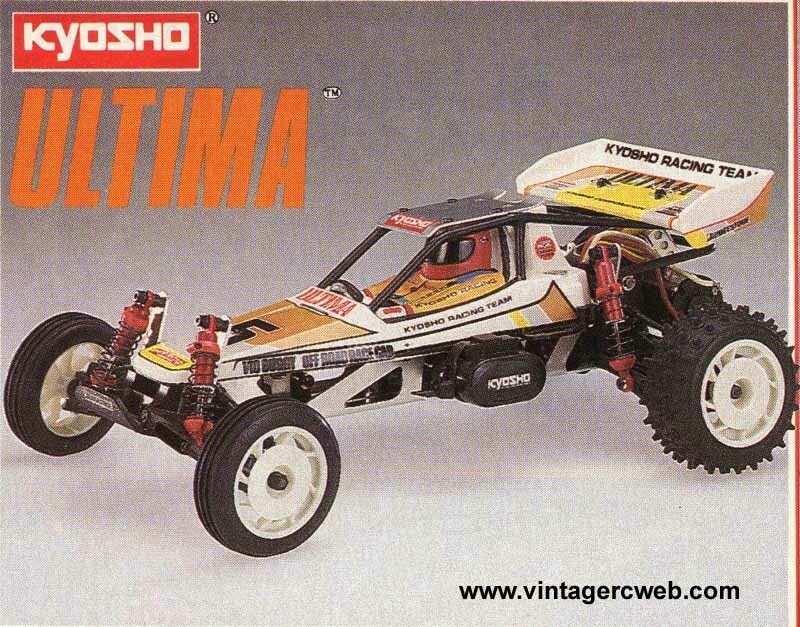 So I pulled my 21 year old Kyosho Ultima out of its box in the closet. I actually switched from the carbon fiber race chassis back to the original aluminum channel chassis (seen in the picture) because its tub shape allows me to bolt on a flat piece of material as a deck. Conclusion: need faster motor or gearing change. I could not find a properly-ratioed gearmotor, so I picked the stock RC car motor and found a small pinion gear. The standard pinion gear had 15 teeth, the smaller one has 9 teeth, so I reduced my speed and increased torque by 60%. I bought a set of front and rear HPI rims at my local hobby shop. 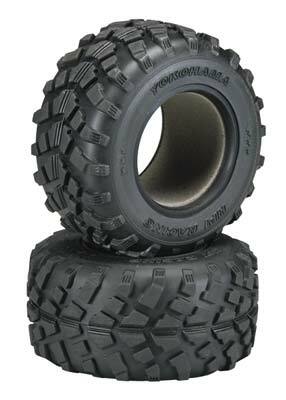 But I got my HPI Yokohama Geolandar tires from a remote hobby shop via eBay. These tires have a much larger diameter than the original tires, which means that the motor-to-pavement system now increased speed and reduced torque; the exact opposite of what I want. However, the tires look great and seem to have a pretty good grip for on and off-road situations. Quantity discount available for 3 or more. (1, 2) Would also require the purchase of a NiMH compatible charger. Argonaut uses Ackerman steering, so only needs one motor to drive. 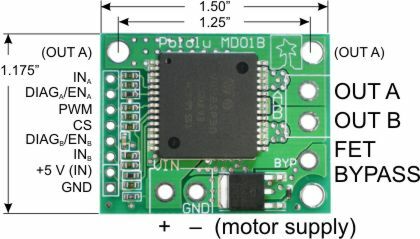 Instead of the ancient electronic speed control that was used on the vehicle for RC purposes, I opted for a robotics motor driver. Many such drivers are available, so I had to whittle down the options to make a decision. I wanted at least 3 amps of current continuosly, 8-bit or more of PWM control and electronic braking is a plus. I did NOT want a serial or RC command interface. I decided on the Pololu High-Current Motor Driver Carrier. It is reasonably priced and uses the ST VNH2SP30-E which is a great chip. The chip has an insanely low on-resistance (19 milliOhm) which lets it conduct 30 amps max, or 10 amps without needing a heat sink.